Some DePauw University students take a break to enjoy some food at the 2017 Undergraduate Ethics Symposium. However, not all schools offer aid in the same way, and not all students are able receive the same kind of aid, says Loutfi Jirari. He is the associate dean of academic life and director of international recruitment at DePauw University, a private liberal arts college in Indiana. Loutfi Jirari, associate dean of academic life and director of international recruitment at DePauw University. Jirari says there are several types of financial assistance that colleges and universities offer students. There is aid that schools award to students with strong academic records. Schools also give special awards to students who are especially skilled at a sport, musical instrument, or other activity. Jirari says the financial aid process can be complex, no matter what kind of assistance a student is seeking. It demands just as much attention as any other part of the college application process. For example, there are two main types of colleges and universities in the United States: public and private. Public universities are controlled by the states in which they are located. Private schools are independently operated. What does this mean in terms of applying for financial aid? For both domestic and international students, Jirari says, there is a world of difference. He should know; he was once an international student himself. 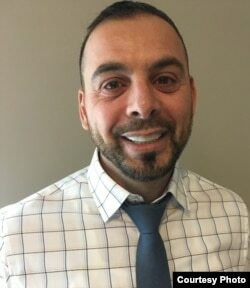 Born in Morocco, Jirari attended one year of college in his home country before finishing his higher education at Southern Illinois University, a public research university. He says most public American universities do not offer any financial aid to international students. That is because those schools have special responsibilities to students living in-state. 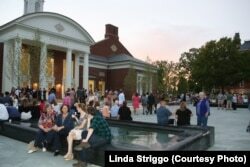 Parents and new students enjoy an event outside Hoover Dining Hall welcoming them to DePauw University. So, Jirari says, the first step for both domestic and international students should be to ask what a school offers. He suggests contacting schools’ financial aid offices directly. Applicants can get answers to questions they may have about the school’s financial aid availability. Jirari also notes that financial aid offices and admissions offices often work together. Any time an applicant contacts and communicates with a school directly, the school sees it as a good sign. Jirari says that students usually apply for financial aid from a university at the same time that they apply for admission. This is typically in the fall term of their final year of high school. American citizens can apply for financial aid from both the U.S. government and their college or university of choice. They do so by completing a Free Application for Federal Student Aid, or FAFSA. International students must apply for financial aid through one of two other methods. They can use the College Board’s College Scholarship Service, or CSS, Profile. They can also use the International Student Financial Aid Application. Almost all U.S. colleges and universities use at least one of these methods to determine how much aid they will give to students, Jirari says. 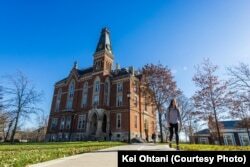 A student walks across the East Campus of DePauw University in Greencastle, Indiana. The main difference between the two is that the CSS Profile costs about $25 for the first school students apply to, and about $16 for each additional school. The International Student Financial Aid Application is free. But Jirari says that neither method is necessarily better than the other. He says that the FAFSA, the CSS Profile and the International Student Financial Aid Application all ask for the same kind of information. That information includes detailed proof of how much money, property and other assets a student’s family possesses. They also ask students to report the number of siblings a student has so schools know if their family is supporting more than one college student. Jirari notes that completing these application materials correctly is very important. For example, students must make sure that all their family’s financial information is reported using the value in American dollars. Otherwise the student risks making it appear that their family is wealthier than they actually are. Also, he says, students must make sure all the documents they provide the school match the ones they use in their visa application. If a student does not tell the full truth on every part of their application, the school can and will find out. 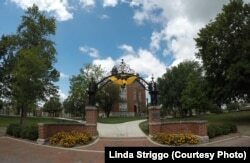 One of the entrances to DePauw University, decorated in the school's colors. In the end, schools do not want money to be a barrier to getting an education. They will give as much aid as they feel is reasonable, Jirari says. But students must fully understand how much a college or university costs. He notes that some schools only list their basic costs of attending classes on their websites without including other costs, such as housing. That is another reason why student should ask financial aid officers questions during every step of the process. Pete Musto wrote this report for Learning English. Ashley Thompson was the editor. How common is it for colleges and universities in your country to offer financial aid? What is the process of applying for financial aid like? We want to hear from you. Write to us in the Comments Section or on our Facebook page.